On Saturday morning at the Misano MotoGP, Yamaha Racing managing director Lin Jarvis met with a small group of media to talk about Valentino Rossi's recovery from a broken tibia and fibula. The injury - sustained in an enduro accident on August 31 - has ruled the Italian star out of his home event this weekend and 'effectively ended' his title hopes. The nine-time world champion is trying to be fit for the following Aragon round, but admits - at just 22 days after his injury - it will be 'really difficult', with doctors estimating he will need 30-40 days. Jarvis said that Yamaha has four options when it comes to replacing Rossi, should he miss Aragon. However one option - test rider Kouta Nozane - was deemed 'unlikely', while mention of prior experience at Aragon would favor Yamaha WorldSBK riders Alex Lowes or Michael van der Mark. As reported yesterday, we understand that it is Dutchman van der Mark who is on standby for the Aragon ride, with a final decision due next week. The Japanese Grand Prix then starts 42 days after Rossi's accident. How does this injury compare to Valentino's injury in 2010? Lin Jarvis: "Much less serious, but probably just as irritating." In terms of the timing? Lin Jarvis: "Irritating because it effectively means his championship chances are over. So whilst the injury is less serious, the consequences are equally as serious. Especially now being still very much in the game, being on form, having done such a great race in Silverstone, coming to his home Grand Prix where we tested so well. It's like a worst possible scenario in terms of timing. It's a great shame." What is your view on motocross or enduro training? Lin Jarvis:"It's very difficult for me to criticise him for crashing in enduro, because of personal circumstances! But seriously, I've always believed you can't wrap up motorcycle racers in cotton wool because it's the nature of the beast and motorcycles per se, sooner or later you will fall off. It's just the way that it is. So what do you do? They can't test ride a MotoGP bike. They can't test on regular race tracks really. So they have to use alternative training methods and the common denominator these days is most of them ride the dirt. "I think that riding on the ranch is different than riding enduro and I think motocross is different again. Riding on a circuit anyway is more predictable, riding enduro there is always the unpredictable moment. The element of surprise. Because if you ride enduro, you do huge distance and you probably only do each part once in a day. You never know what you are going to find. "So I don't think enduro is the best training, personally, for riding MotoGP. But that said, they test at Misano, they do mini bikes, they do the ranch, many different disciplines including motocross. It's the way it is. I wish he hadn't ridden enduro last Thursday! But he's done it several times this season, he's done it many, many times in the past. So what can you say." Is the plan that Rossi will at least try to ride at Aragon? Lin Jarvis: "There is no plan at the moment, I would say. Of course, we have a plan to replace him, because we must. By the contract, after withdrawing a rider within 10 days you are obliged to replace the rider. Which is a very correct rule, because the show must go on, shall we say. "So we will nominate a replacement rider for Valentino at Aragon. Will Valentino go to Aragon? I would say he will only go there if he is convinced he will be able to ride and race. Not only ride. Riding around is not interesting to do. If he's not going to be up there fighting for the top five or six positions, I don’t think he will go. Can he race? Let's see. The doctors have said the recovery time should be longer than that. But sportsman is quite extreme. We've had in our team the most extreme experience with Jorge Lorenzo. So never say never. "But I think this is a little bit different now with Valentino. He has the experience so he will know how the feeling is and when he can get back. Obviously, we will do a test with him before him participating at Aragon, he would make a ride, probably on an R1. Will that happen? I don’t know. It depends on how he is feeling. It depends on the pain. The physiotherapy. Everything." Do you have an idea of who could replace Rossi at Aragon? Lin Jarvis: "I have a very good idea!" Lin Jarvis: "Not today! Obviously, we have four candidates who could replace him. We have two test riders in Japan, which are Nakasuga and Nozane, then we have two Superbike riders, Alex and Michael. So it will be one of those four and we'll decide next week." Lin Jarvis: "I don’t know what Sam said, so I can't really comment." So Alex is still one of the options? Lin Jarvis: "As I've said, we have four options." Is there a preference between the two Japanese test riders? 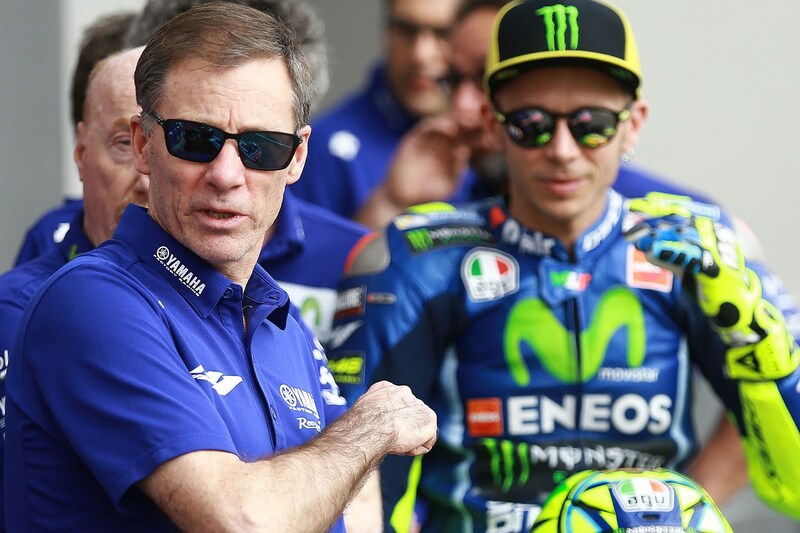 Lin Jarvis: "I think it would be a tall order to ask Nozane to replace Valentino in Aragon. I don’t think he has experience of the Aragon circuit. He certainly doesn't have the multi-year experience that Nakasuga has. Nakasuga has ridden in many MotoGP races, does a wild-card every year and replaced Jorge at Valencia, doing a great job. "Nozane is one of our options but definitely not the most likely guy to get the call. It's more likely that we'll use him as a wild-card to get him up to speed. I think it would be too much pressure on the poor young guy to throw him into the lions' den." Lin Jarvis: "We have four, but three of them are more likely." Assuming Valentino is out of the title chase, is it worth the risk to come back at Aragon? Lin Jarvis: "This is a very valid point. This is something that will be factored into the decision making. Nobody knows what’s going to happen in any single race, as we’ve seen. Sunday’s going to be raining here so there are going to be more variables coming into the game. Maybe he will still have an extra motivation to try and come back because maybe the competitors will be in difficulty, or maybe not. "We have to wait and see. For sure, it’s one of the factors, but the primary factors to decide is whether he is comfortable and fit and feels he can do the job. That remains the same. The other thing is perhaps the additional motivation. There’s no pressure from our side as a team so we’ll judge according to his fitness."